When anorexia nervosa strikes an individual and her family, everyone is thrown into confusion by the mixture of emotions that emerge. One of the strongest is fear. The fear arises partially because so much is unknown. What has caused this to happen? What will happen now? What can we do about it? This book is an attempt to answer some of these questions. 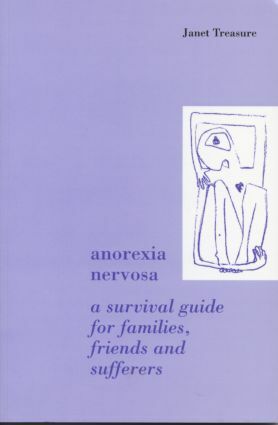 Unusually for a book on anorexia nervosa, this book includes sections for parents and other carers alongside a section for the sufferer herself. So often books have been written which only give one perspective. In her work with patients and families Janet Treasure has tried to ensure that family and professionals collaborate and co-operate in order to overcome the power of the illness. Many families have used and commented on various versions of this book, and have helped to form its content. Experiences and problems have been shared, and solutions generated. Anorexia nervosa is a difficult illness to experience and write about because it spans such an extreme range of severity and it can also develop in childhood and adulthood. Nevertheless, there is much common ground throughout the range. Readers are therefore encouraged to use this book as a tool box rather than a new engine and to ask the questions, 'Is this part relevant for me? ', 'Can I use it? ', 'Shall I try it? ', rather than trying to fit it all into place and expecting it to run smoothly. What can be done about eating? What are the dangers of anorexia nervosa?